Nottevera is a niche luxury lifestyle brand label based in New York, but has design and manufacturing facilities in Italy. 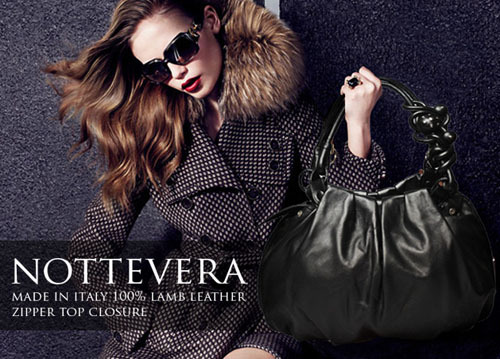 Nottevera translates into “true night” and this Italian luxury label caters to sophisticated trendsetters from around the world. The Nottevera target market is high-end fashion for uber contemporary young ladies. Their fashion collection includes ready-to-wear leather handbags, shoes and related accessories. All products are designed and made in Italy in limited quantities and select sizes. A Nottevera girl is confident and definitely knows the difference between style and the current trends. These fashion trendsetters define themselves with original ideas, and not just brand names only. Nottevera has a longstanding relationships with both family owned tanneries and mills in Northern Italy. These strategic partnerships in Italy ensure they are able to closely develop their own custom patterns and prints and have strong control of the manufacturing process. The end goal of this luxury brand is it strives to ensure an uncompromising level of high quality, creativity and exclusivity in all their leather fashion products. If you need assistance locating that perfect gift for the holidays or other special occasions, please contact The Life of Luxury and let us help you.